The Wisconsin Farm Bureau Federation’s policy is established by farmers through a structured policy development process. Suggestions and policy ideas come directly from members who propose and vote on them at county Farm Bureau annual meetings. Policy ideas work their way up to the Wisconsin Farm Bureau Annual Meeting each December where delegate members vote on the proposals. This process continues at the national level as well. 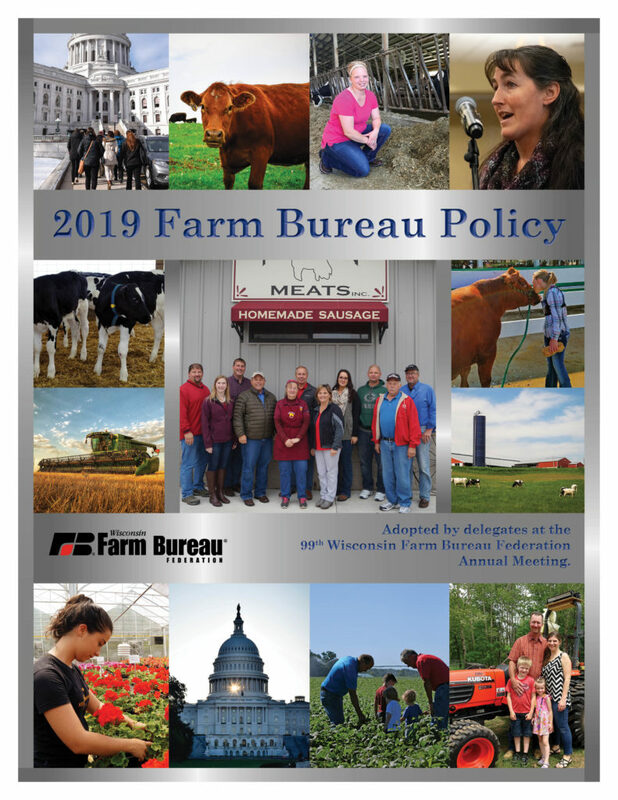 Click to view the Policy Book adopted by delegates at the 99th Wisconsin Farm Bureau Annual Meeting. Wisconsin Farm Bureau Federation is a grassroots organization that works on behalf of farm families and other individuals who support agriculture. Farm Bureau got its start with local farmers meeting to discuss issues of concern in order to devise ways, or policies, to resolve these issues. Each year since, county Farm Bureau members have met to discuss pertinent issues as part of the policy development process. Local involvement culminates with discussion and votes on proposed policy at county Farm Bureau annual meetings.